Home Baby Moms Share Their First Indication of Pregnancy, Which Didn’t Include a Test! Moms Share Their First Indication of Pregnancy, Which Didn’t Include a Test! Now, these are stories that, while the moms narrated it, they mostly broke into laughter, or smiled as they remembered that moment when they took a second look at themselves, and suddenly it dawned on them that they were pregnant. Even without having done any test. They just knew. Take a friend of mine, and a mom of three kids, two boys and a girl, Folake. She is the quintessential tomboy. Every one knew her to be macho-like, not given to feelings of weakness at all. Having being raised by two military parents,and the only girl among five brothers, what would you expect? However, all of that ceased to matter when she got pregnant with her first son. She told me the story of how she, being a newly wedded lady, had been sitting in her living room, watching TV, and the next thing she knew, she was crying, as in seriously bawling, so much that it got the attention of her husband, who was in their bedroom. He rushed in thinking something had upset her, but nothing had…zilch! She was just crying, and there was no reason. That was surprising for both of them. Throughout that day, she said her husband looked at her askance, hovering around her, to ensure she didn’t cry again, and that in itself grated on her nerves, making her cry, instead of getting angry as she wanted to. The tears kept flowing until she missed her period, in the third month of her marriage, and she did a test, which turned out positive. It was the same trend with her other pregnancies, and that became her own unofficial pregnancy test. Even now that she has stopped child bearing, her youngest is 9 years old, anytime she is being so emotional, she said her husband gives her one kin side eye, and always asks if she is pregnant. And her answer for the last seven years has been, “You wish!”. I’m sure, you have heard some Yorubas asking a clingy and needy child, if it’s mom is pregnant. I ask my kids that question a lot, especially, when my youngest madam is in cuddle mode, which thankfully is not all the time. I can only manage one ‘cuddler’ at a time, not two, as her brother is an all time ‘cuddler’. Well, it happened in the case of Ada’s last pregnancy. She was two months pregnant, and she had no idea. As in, no idea she was pregnant, everything was normal, but her 4 year old seemed to know something was up, or that someone was on the way to usurp his last born position. He became extra clingy, wanting her attention more. He no longer allowed anyone tend to him, only his mom would do. She would be sitting beside her husband, and before she knew it, her son would shove and push his way into a spot between his parents. This was the same boy who had refused to be carried since he started walking, but now, he couldn’t get enough of his mom’s arms. At first, she thought it was something at school, and went there to find out how he was doing, and his teachers said, while he was doing fine most of the time, he was having more crying/sulking episodes lately. Strange again, as he had been so happy to finally go to school like his older sister. It was not until Ada came down with malaria, that she went to the hospital and a routine pregnancy test was done, and she was given the happy news. That was when she realised the reason for all her son’s recent drama. He could sense the new life growing inside her, even before she did. 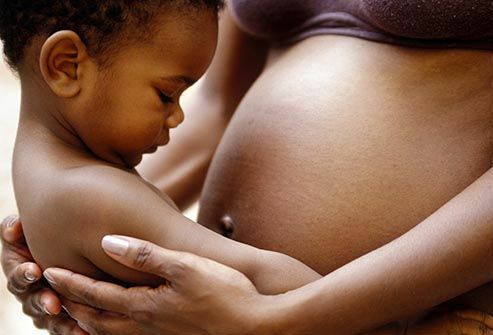 While she had always passed this off as a superstition, she had also seen it happen to people, while she was growing up in a community, dominated by Yorubas, who believed that your youngest child can sense your pregnancy, and acts up as a result, whining and crying a lot. That is until it happened to her. And now, to the nose woman. Morenikeji was given away by her nose, which seemed to suddenly dominate her face, the minute she got pregnant. So, anytime she looks in the mirror, she is actually having a pregnancy test done, “Has my birth control failed, is the nose getting bigger now?” Regular question for a mom of one, who is so worried about not getting pregnant anytime soon. A few weeks before she did the test that confirmed her pregnancy, because she had missed her period for two consecutive months, her husband had mentioned in passing that, it looked like her nose was getting big, and she had been offended, “Is that how you compliment your new wife?” and she had gone ahead to turn up same nose at him, until he apologised for saying her nose was big. Well, it was not only her husband who noticed that her nose was big, her friends mentioned in passing that her nose was big or/and when did she start having oily skin. At least two people would talk about her nose in a day. After one too many mentions of her nose in a day, she went to the mirror and truthfully, the nose looked like the only thing on her face, in all of its royal oiliness. She thought, at first, it was something she might have eaten, and it was a reaction. She went to see her doctor, as she already had a complaint before, having not seen her period for two months in a row. Instead of being sent off with some prescription, she was congratulated on her pregnancy, and asked to come back to start antenatal classes. “Oh my nose!” was what she told me, she had said. The main gist, her nose had already been telling her, but she had chosen not to listen, and had instead been picking fights with all the nose-watchers. And did that nose become bigger and more oily? You bet. Even before you see Morenikeji’s moderate bump, you would surely have noticed her nose tey tey. As for me, my belly button is a dead give away. I cannot tell you the number of times it has made me count my calendar, and check and re-check my dates, to ensure nothing unexpected has happened again. If you get my drift. All this shows that our bodies give signals, once there is a baby growing. The question is, do we catch the signal? No, make that, do we listen to our bodies and not necessarily, when it comes to pregnancy alone, but in other areas too? What was your own pregnancy symptom before testing? Please share. I’m sending truckload of sticky wishes the way of our TTC Moms. Previous articleYour Skincare Routine and Your Fertility!